Google’s self-driving cars may have racked up over 700,000 miles without causing an accident, but the broader project still faces technical and legislative hurdles; the cars struggle to drive in rain and have never been tried in snow, for instance, and the testing of autonomous vehicles is only legal in three states. That’s not stopping the search giant from taking meaningful – albeit small – steps towards a market debut, though. Yesterday, Google revealed a version of the the company’s self-driving car with nothing but a start button, stop button, and LCD screen. There is no wheel, accelerator, or brake pedal. It’s the purest embodiment of Google’s driverless vision yet. The car, which is electric and seats two, can be summoned with a smartphone. It has a range of about 100 miles and is limited to a speed of 25 mph – indications of its intended use for taxiing folks around town. On the engineering front, the car has an upgraded sensor mount more accurate than the arrays found on Google’s self-driving Lexus and Toyota vehicles, and has a body designed to minimize damage from a crash. 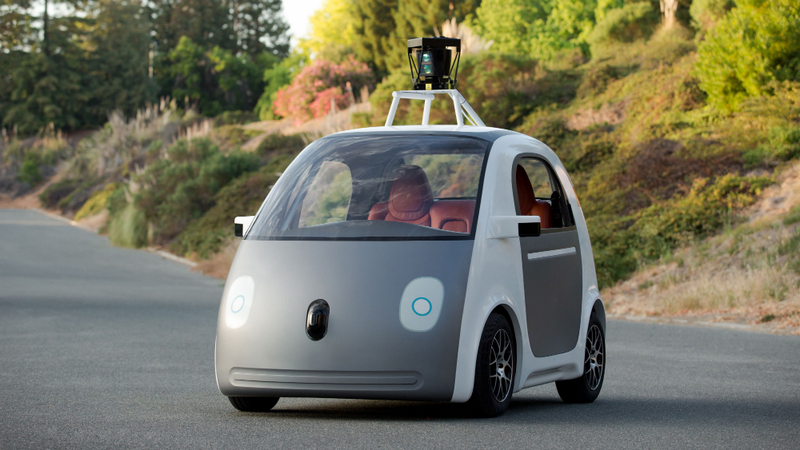 Google says it will begin testing the cars next year. The company’s ultimate goal is to start a small pilot program in a couple of years. That, of course, will hinge on how well the self-driving car team is able to perfect the vehicles’ software and hardware, and whether or not regulatory questions are resolved before then. Still, Google’s progress is encouraging.